Throughout his career in communications and media relations, Bill Ray has experienced the industry from all sidesas an editorial page editor, communications director for advocacy organizations, congressional press secretary and senior consultant on statewide, local and special district campaigns. Bill spent five years as a member of the Colorado press corps, highlighted by several years as the editorial page editor of the Longmont Daily Times-Call and a member of the editorial board of Lehman Communication Corporation (which included the Loveland Reporter-Herald and Canon City Daily Record). He spent time in Washington, DC as a press secretary in the 103rd Congress and as a policy and communications associate for the cable television industry. 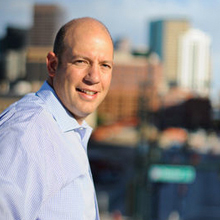 Back in Denver, Bill served as the communications director for the Denver Metro Chamber of Commerce. Bill specializes in issues management and strategic communications for organizations involved in public debates. This includes legislative, regulatory and ballot campaigns at the state, regional and local levels. He provides public affairs, media relations, crisis communication, grasstops communication and coalition development services. His firm, WR Communications, represents a variety of groupsmany with a stake in the Rocky Mountain region's most critical policy areas such as energy, water and health care. Several Fortune 500 corporations are clients. Bill, his wife Melissa, and their three children, Aden, Liam and Marin, live in Denver. Bill spends much of his free time playing with his kids and coaching and playing lacrosse. Occasionally he sneaks up to the mountains to ski or fly fish. He holds a Master of Journalism Degree with honors from Temple University in Philadelphia and a Bachelor's Degree in Political Science from Fordham University in New York City. Bill is an active volunteer with the Rocky Mountain Chapter of the Juvenile Diabetes Research Foundation.